Ahirman is a seeker of magic of all kinds. He searches Naelvich for every spell he can find. He is knowledgeable about the arcane and because of his travels, knowledgeable about geography, nobility, and the planes. His goal is to learn every arcane spell he can through any means nessacary. He has been known to attack libraries and wizardry schools to plunder knowledge from books and scrolls. 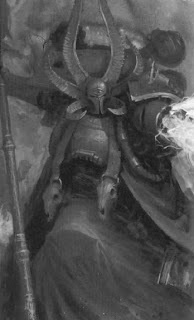 Ahriman made sought out the patronage of evil aligned arcane gods to further his quest for power. Their mark manifests on his right shoulder as an Ouroboros symbol. Arhiman is not a very likeable person as his only care in the world is using magic to increase his own power. Because of this he has an extremely low charisma. Ahriman is an exile from the Sorcerous Ouroboros cult. His goal is to find the Arcane Library and find the Tome of Complete Arcane and return to claim leadership of the cult. "Knowledge is power, and with the key to the Arcane Library I shall claim it all."